The last week or two has produced some amazing seasonal snow. The media has confirmed this is the earliest heavy snowfall since the dawn of time or some other scare-mongering weird world event! It’s Winter, it’s snow, it happens (no chips on my shoulder)! But fortunately being in the centre of the country we don’t really get the worst of it. Anyway, after some of the heavier snow had subsided and made the roads a little safer, I ventured out to Martinshaw Woods near Ratby in Leicestershire. I’ve heard from other people and from my own experience that Wood Blewits (Clitocybe nuda / Lepista nuda) are quite common there, and being persistent even during heavy frost I thought I’d take my chances. 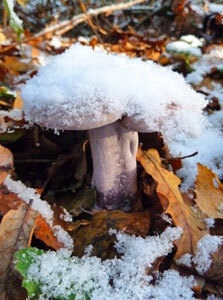 I was pushing my luck in the snow but I did find some mushrooms clinging on to life in the clearer areas of the woods. Eventually I found this solitary Wood Blewit, nearly missing it with its white snowy hat against a white snowy background disguise! This mushroom is quite unmistakable in appearance although there are a some Webcaps sharing similar features. Look out for web-like fibres on the stem that were initially connected to the cap edge when young. If unsure, take a spore print. The Webcaps have a dark rusty brown spore print as opposed to the pale pink of the Blewits. In fact, I had an issue with this spore print business. Although pale, the print really looked more very light brown than pink. Take a look from last years post on Wood Blewits. The Wood Blewit is commonly called Blue Hat or Blue Cap, but some people still call it a Blue-leg (the Field Blewit)! Well, that’s understandable I guess. The Wood Blewit, when younger, has a more blue-violet tint about it’s cap (Blue-Hat), but this fades over time to a paler brown colour. The gills share this trait – they remain lilac-blue for a while until fading to buff. The fibrous stem retains it’s unmistakable blue-violet streaks, hence people choosing to call it a Blue-leg. So Field Blewits and Wood Blewits are very similar indeed and to get them mixed up, apart from their environment they’re in, is understandable. The Field Blewits cap is always pallid to dirty brown. It’s actually tastier than our Wood dwelling friend but unfortunately less frequent. It can be found in pasture land, and most recently for me, in someones grassy garden! One thing to remember with Blewits is that some people can have an allergic reaction to them. People recommend Par boiling them first or generally cooking them ‘thoroughly’, as I do. Fortunately I’m OK with them. They are nice to eat and they do need a longer cooking time I think because they are a little tough. I like the texture to be half way between solid and soft! But because of their texture they’re good for pickling. I haven’t tried that yet but I’ll let you know when I do. I found loads of these in my back woods last year but was very hesitant in eating them due to the reports i’ve read. The last thing I want is an upset tummy! I’m very wary about eating mushrooms unless they are widely regarding as excellent eating. Hi Matthew. After successfully identifying the Wood Blewit, it’s best to try just a small biteful first (after being cooked well) and see how you get on. You could be missing out. Thanks for sharing your experiences with Blewits. The Field and Wood Blewit are very similar indeed. Wood Blewits can be found in grassy situations such as near hedgerows and gardens. A good tip for differentiating between the two is in the identification of the gills. The Field Blewit has ‘off white to flesh coloured’ gills with no hint of violet at any stage. It can usually have a stronger blue/violet stem, hence the English name ‘Blue Leg’. Either way both of these Blewits are delicious, and it was good of you to point out the ‘spore print’ issue. Light brown and pale pink seem close. You only have to worry if it is a dark rust brown colour. wood blewits or blueys[uk] are particularly nice when fried in with your bacon…they are also sold in many market town stalls and fetch decent money ..has much as £9 a pound…great tasty food…another varity is the field bluey which is found in farmers fields usually ..they are much bigger and have a blue tinge running through the stalk with a off whitish top…obviously if not sure of what you picking then leave well alone …but they to are awesome eating if you got the taste for them. I am as nearly certain as I can be that these are Wood Blewits – growing in a clump at the corner of a grassy field. HOWEVER the spore print does not look pink to me. Being colour-blind partially certainly doesn’t help, but if you would be able to take a look at the website link http://www.ipernity.com/doc/coldwaterjohn/35677507 and give me your opinion, that would be great! I agree, the spore colour isn’t a ‘convincing’ pink. More of a very light creamy brown with a slight hue towards pink. You should only worry about mistaking Wood Blewits with some similar looking (but rarer) Webcaps – However, their spore print is ‘distinctly’ dark rust brown. What you have in the picture is a Wood Blewit spore print.